Search Results for "b-25 mitchell"
B-17 Flying Fortress and B-25 Mitchell World War II bombers flying towards the camera. Mute. Some heat haze distortion. Recorded in 4K, ultra high definition. Pan from B-24 Liberator to B-25 Mitchell bombers from World War II parked side by side. Recorded in 4K, ultra high definition. BELLEVILLE, MI, USA - AUGUST 2014: Air show visitors walk around a historic B-25 Mitchell bomber plane at airfield. Recorded in 4K, ultra high definition. A World War II era B-25 Mitchell Medium Bomber flies overhead. CHINO, CA - FEB 4: A World War II vintage B-25 Mitchell starts its engines onlookers watch in Chino, CA on Feb 4, 2012. The museum prides itself on displaying functional aircraft. Douglas C-47 Skytrain historic military transport and B-25 Mitchell bomber wait on taxiway at airfield. Recorded in 4K, ultra high definition. B-25 Mitchell bomber plane from World War II in flight, passing camera. Recorded in 4K, ultra high definition. BELLEVILLE, MI, USA - AUGUST 2014: Air crew converse in front of a historic B-25 Mitchell bomber plane. Recorded in 4K, ultra high definition. B-25 Mitchell bomber plane from World War II in flight, banking and passing camera. Recorded in 4K, ultra high definition. Tilt down from sky to show the cockpit of a B-25 Mitchell bomber plane from World War II parked in early morning. Recorded in 4K, ultra high definition. Tilt up from sunlit concrete to B-25 Mitchell bomber plane from World War II parked in early morning light. Recorded in 4K, ultra high definition. BELLEVILLE, MI, USA - AUGUST 2014: Tilt up to a front angle of a historic B-25 Mitchell bomber plane at dawn. Recorded in 4K, ultra high definition. CHINO, CA - FEB 4: Planes of Fame museum goers view a B-25 Mitchell on display in Chino, CA on Feb 4, 2012. The museum prides itself on displaying functional aircraft. 1943 - North American B-25 Mitchell bombers taxi on an airfield in Nadzab, New Guinea, in World War 2. 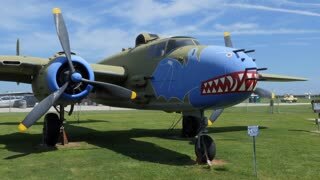 Close view of B-25 Mitchell bomber plane from World War II parked in early morning. Recorded in 4K, ultra high definition. B-25 Mitchell from World War II waits on taxiway at airfield. Recorded in 4K, ultra high definition. BELLEVILLE, MI, USA - AUGUST 2014: Tilt down to a wide view of air crew standing in front of a historic B-25 Mitchell bomber plane at airfield. Recorded in 4K, ultra high definition. B-25 Mitchell bomber plane from World War II flies fast and low, past camera. Recorded in 4K, ultra high definition. B-25 Mitchell bomber plane from World War II flies quickly past camera. Recorded in 4K, ultra high definition. BELLEVILLE, MI, USA � AUGUST 2014: Wide view of B-25 Mitchell bomber plane from World War II turning off engines and parking at an air show. Recorded in 4K, ultra high definition. 1945 - The size and capabilities of the B-29 are compared to the B-25 and B-17. 1940s - B-25 bomber planes takeoff from the airstrip at Nadzap, New Guinea to attack the Japanese, and the muddy campsite at Cape Gloucester, New Britain, during WWII. Steadicam motion up to and around a B-25 bomber from WWII era at the March Field Air Museum.